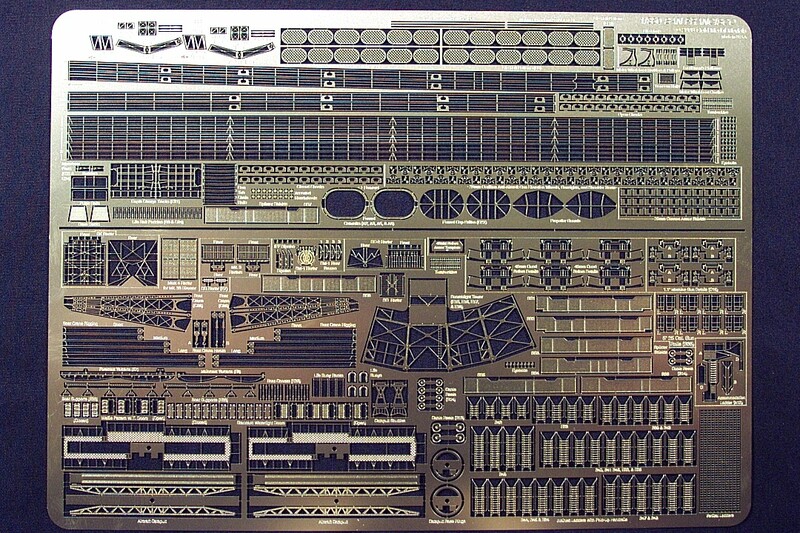 This set is intended to fit the Trumpeter 1/350 scale kit of the U.S. Navy WW2 heavy cruiser USS San Francisco and her sisterships. Contains custom-fitted railing for the main decks plus ample railing in several styles for all remaining decks and platforms; Inclined and vertical ladders; SK, Mk. 3, Mk. 4, SM-1, SC, SC-2, & SG radars; funnel cap grilles and detailed catwalks for both funnels; armor and/or other details for 40mm Bofors guns, 20mm Oerlikon cannon; 5" 25 cal. gun mounts, & 1/1 inch quad machine guns, see-through bottoms for all life rafts; life raft paddles; correctly detailed replacement yardarms for both masts; watertight doors in open and closed positions; cable reels in two sizes; correctly detailed replacement searchlight platform; two detailed aircraft catapults; two crane booms and rigging; accommodation ladder with davit; rudders, pulpit rails, aft decks, & support cradles for ships' boats; struts and propellers for two SOC Seagull seaplanes; two depth charge roller tracks; life buoys & racks; life rings; two leadsman's platforms; eight replacement 3-D relief-etched splinter shields for 5" 25 cal. gun mounts; assorted handwheels; two propellers guards; and a binnacle for the ship's bridge.